This headstall is a 3/4 inch roll round Browband with a caveson and is made of Chestnut bridle leather. The browband, caveson,and cheeks are rolled round. The head has a 3/4 inch buckle on the left side behind the ear and 1 1/4 inch conchos at the bit ends, ½ throatlatch with a No.115 Sterling buckle and tip. Caveson and browband are swelled in the middle with sterling plates that have 14 Kt. gold horse heads in the centers. Solid sterling face chains with two 1 3/4 inch conchos in the center; top concho has the ranch brand in 14 Kt gold and the bottom concho has a 14 Kt gold horse head in the center. The face chain strap is 1/2 inch with three-piece sterling buckle set. The browband and caveson both have 4 sterling ferrules and the cheek pieces have 5 sterling ferrules on each side. 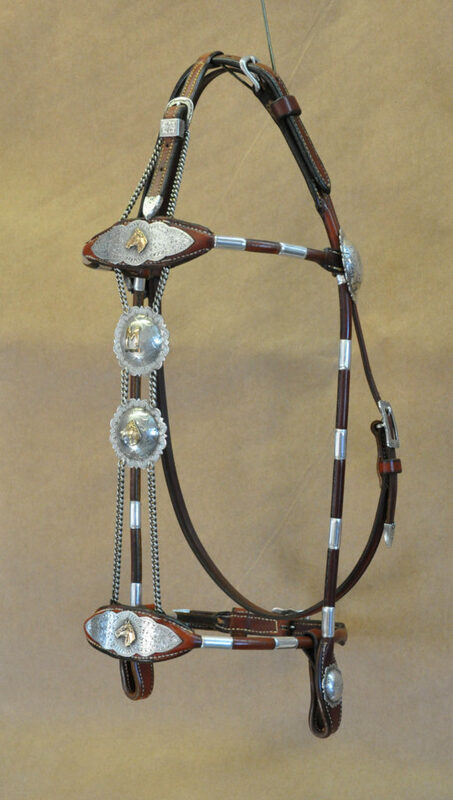 This headstall was a rebuild of a 1940-era Visalia Stock Saddle Co. headstall; all the sterling silver marked Visalia. It is property of a ranch family in the Cottonwood, California area. I refitted and polished all the silver and place on all new leather. This is a true piece of history.